Becoming a new parent is one of life’s most exciting moments. The joy that fills parents when they meet their son or daughter for the first time makes them want to shout the good news from a mountain top. Many parents choose to send out birth announcements to show off their beautiful bundle of joy to friends and family. These announcements can easily be created by using a birth announcement template. 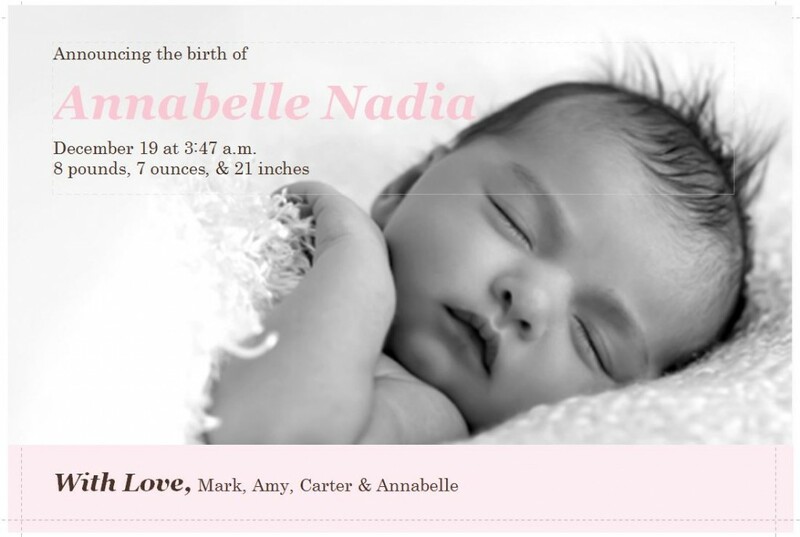 Why Choose a Birth Announcement Template? While many professional companies design and produce birth announcements, there are many benefits to creating your own using a birth announcement template. The first benefit is that the template is available for free right here on this page. Using a professional service can be quite expensive. New parents already have enough expenses buying diapers and food for their new baby. This is a great way to save money, without sacrificing quality. The template is completely customizable. This means that you can design the announcement exactly how you want it instead of relying on someone else’s creative vision. The template is easy and quick to use, so that parents can start and finish the project in between the baby’s feedings. This step by step guide will help you use the birth announcement template to create your own unique proclamation of your precious baby. Download the file to your computer by clicking on the download button, then hitting save. Once the file has downloaded, double click on it to open the file in Microsoft Publisher. This software is included in the Microsoft Office suite. The first page shows you a completed announcement to provide an example of what the finished product will look like. Now you must consider what type of paper you will printing on. If you will be using standard paper, proceed to page two of the document. These announcements contain dashed lines to help you cut out the announcement straight. If you will be using perforated paper, proceed to page three of the document. These announcements do not contain the dashed lines, so that the lines will not print on your picture. Regardless of whether you choose standard or perforated paper, for best results the paper should be thick card stock or photo paper. A glossy finish paper will provide the most professional looking results. There are two text boxes on the page – one in the top left corner and the other in the lower left corner. Click in these boxes and edit the text to change the names, dates, and measurements to your baby’s information. If you wish, you can add more information to further customize your announcement. Click on the picture icon to select a picture of your baby from your computer. Choose a picture that clearly shows your baby’s adorable face. Review and save the announcement. Carefully check over for any typos. It’s often best to step away from the announcement for a few hours before reviewing it a final time. You may notice different things by looking at it with fresh eyes. Print your announcements. Once they are printed, cut them out and send them out for everyone to enjoy.